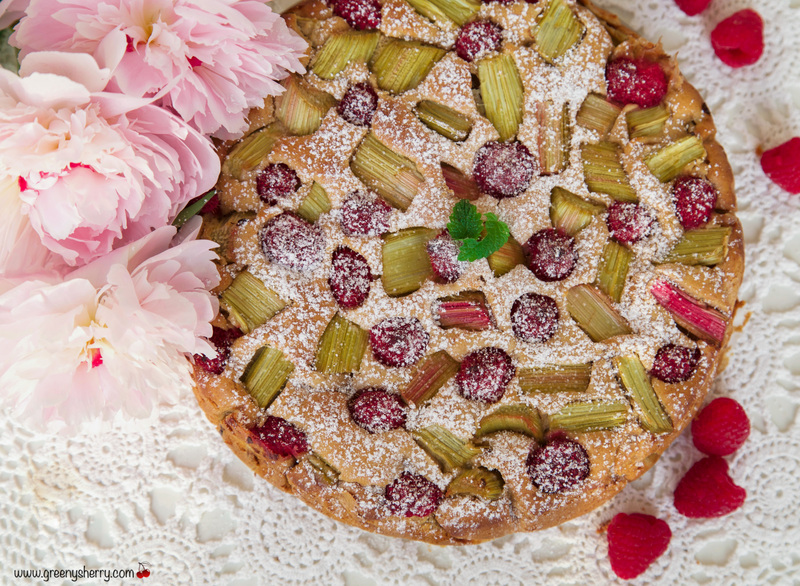 Hello peeps, today I wanna share one of my favorite vegan bakery recipes: Rhubarb cake with marzipan and raspberries. 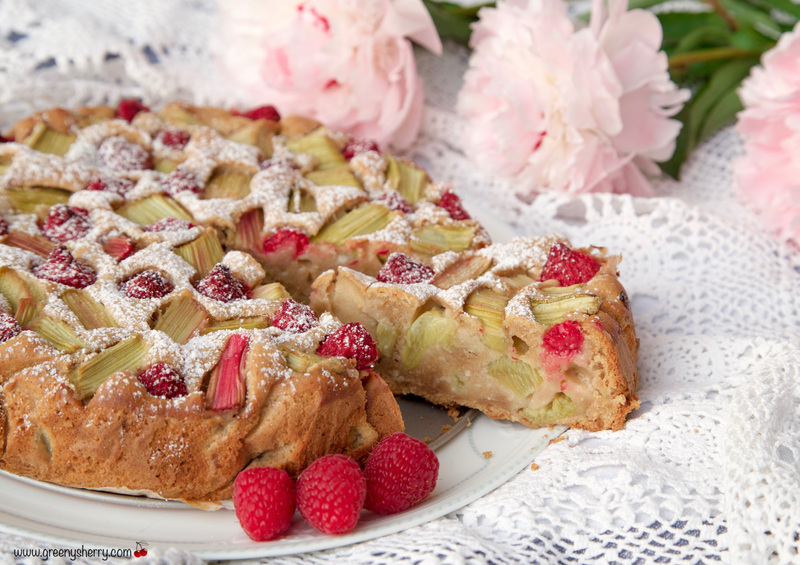 It tastes so good, the combination of the sour rhubarb and raspberries with the sweet marzipan is extremely delicious! Furthermore the cake is really easy to make. Its kind of an oldschool cake, like granny style hehe. Not gluten free, but I think you can easily substitute the flour I use in this recipe with a GF version. Yep, it is not one of my healthiest creations but it is 100% vegan and delicious – that’s what counts, right? You know what they say….Yolo😉. So treat yourself (and your family and friends) with this yummy piece of pie! Btw, did you know that rhubarb botanically is a veggie? So from this point of view the cake IS healthy indeed ;-). Oh, on top of this it is perfect to convince even the most critical person of the fact that vegan food is more than eating greeny leaves, stones and seeds. And I mean, it is just so beautiful, don’t you think? 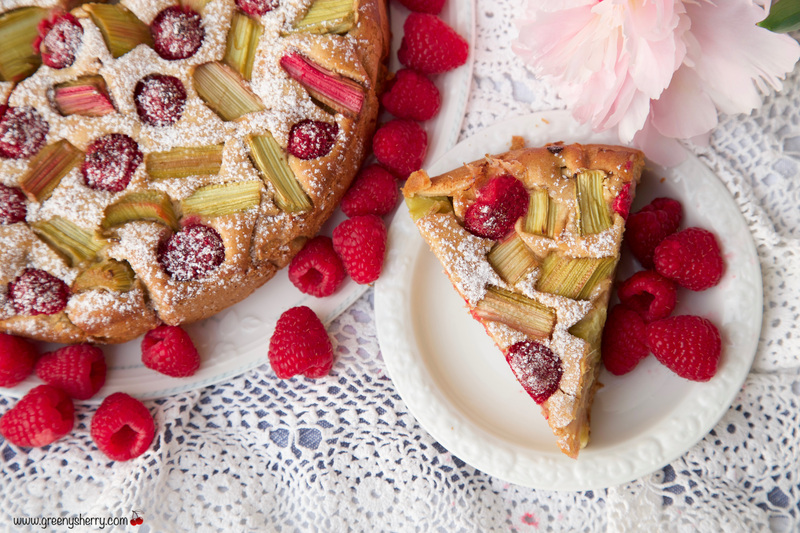 Vegan rhubarb cake with raspberries and marzipan. Sweet & sour and oh so delicious! Preheat oven to 180 degrees. Coat pan with baking paper. Prepare the soy „egg“ (or chia or flaxseed “egg”): Whisk 1 Tbsp soy flour with 2 Tbsp water. In a large bowl,with an electric mixer, beat butter, the “egg“, sweetener, spices, plant milk and Amaretto until light and fluffy. With mixer on low speed, gradually add flours and baking powder; beat just until combined. Add the marzipan paste and mix again. Now stir in the rhubarb pieces. Spoon batter into pan; smooth top. Carefully press raspberries into batter. Bake until a toothpick inserted in the middle comes out clean (but slightly wet), 40-50 minutes. Cool on a wire rack 10 minutes. Turn out of pan onto a cutting board or baking sheet. Dust with confectioners’ sugar before serving, if desired. I hope you’ll like it and please let me know if you try the recipe!